Nearly all threatened Spectacled eiders spend the winter in a small area of ocean and sea ice south of St. Lawrence Island in the Bering Sea. 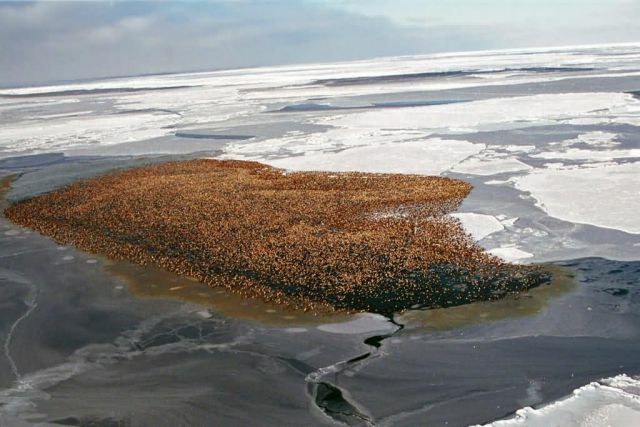 This picture shows tens of thousands of spectacled eiders roosting in an open lead of the ice pack, approximately 100 km south of St. Lawrence Island, Alaska. Prior to 1995, no one knew where this species spent the winter. The discovery of these remarkable wintering flocks of spectacled eiders was made possible through the use of satellite radio transmitters.